Southend-on-Sea is officially the warmest and driest place in the UK - they don’t call us ‘Sunny Southend’ for nothing! These Met Office charts prove it. 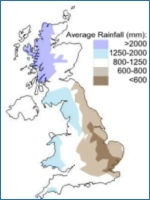 This one shows we have the lowest average amount of rainfall in the UK. Great Wakering, a village 4 miles from Southend-on-Sea, has repeatedly been awarded the title ‘Driest Place in the UK’. 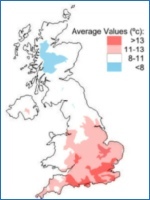 And this chart shows we are in the warmest average area of the UK. It’s no wonder millions of people each year visit Southend-on-Sea!